Big Toucan Mask... and he is wearing a hat. I warned you... I would make a bird mask, too. Check out my giant toucan head. I am also pretty excited about his hat. I was yard sale hopping and a super nice old guy gave me the hat for free :) It was olive green, but I had to paint it some other crazy color and landed on orange. Add a big blue ostrich feather and boom, sweet hat. I was feeling sick so I decided to put my Toucan Mask on around the house. It made me feel a little better. For some reason I feel kind of silly about making masks, which is weird because I'm ALL about being silly. Maybe it's because they're so HUGE and I haven't got many events where I can use them. Halloween, and.... um... that's it. Haha! But they are so funny and fun to make... Bobby thinks they're awesome. Also, unrelated, but not really. I am having this idea to challenge myself to NOT BUYING any new craft supplies for 3 months (super-unique thrift shop and yard sale finds don't count! I'm talking like Hobby Lobby and Michaels stuff) and crafting my brains out to reduce my outrageous stash. And maybe put more in my Etsy Shop than just Witch Bookmarks. I feel like I haven't been making much lately because of all the busy-ness. Should I take the de-stashing challenge? 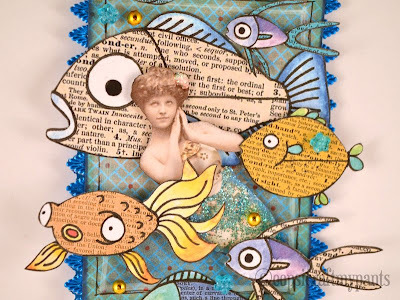 Alpha Stamps is at it again with a new kit for May and a delightful new ATC swap. 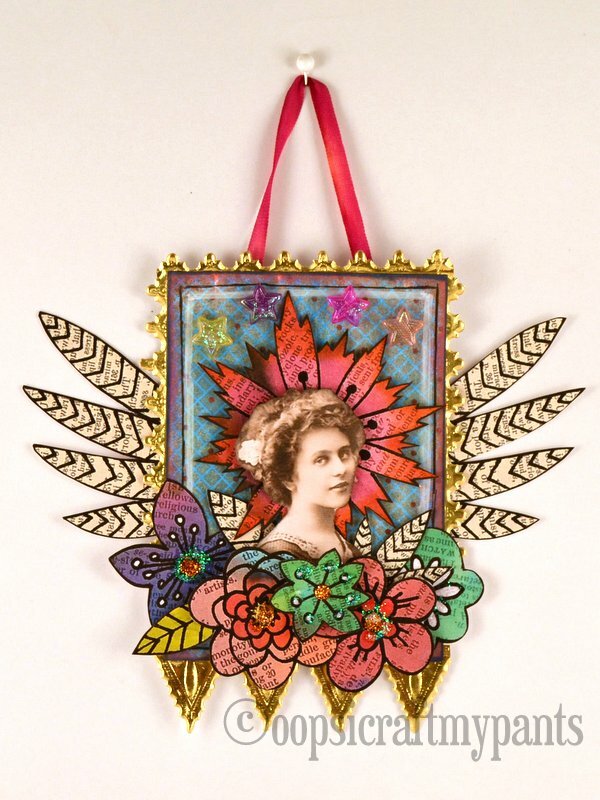 this month is "The Language of Flowers"
And I think this one is my favorite ATC of the bunch. Violet Ladies... So go join the swap. It'll be fun and springy! Boy oh boy, have I got a backlog of projects to post! Why does blogging keep getting pushed back on my list of things to do? Because... I am busy. But hey, that's a good thing. I'm happy. Etsy sales have been real steady, I've got plenty of fun Alpha Stamps DT work to do, and I'm doing 2 callings for church. Recently got called to the Stake Young Women Presidency, and I'm still happily doing my duties as YW Secretary in our ward. Spring is a BUSY time, so many things coming up. Especially Girl's Camp... Of which I get to be in charge of teaching crafts :) 4 different projects with 100+ teenage girls. It's going to be crazy... Crazy awesome. I need to do a Camp Crafts post, because there's gonna be some cool stuff. Anyway, enough rambling. Let me tell you about this monster mask I made. The horns were oh-so tedious, but ended up really cool. They're just made of cut out bits of cardboard box. I drew the horn shapes first, then the circles using a ruler to measure the right sizes the ribs of the horns, then cut them all out. 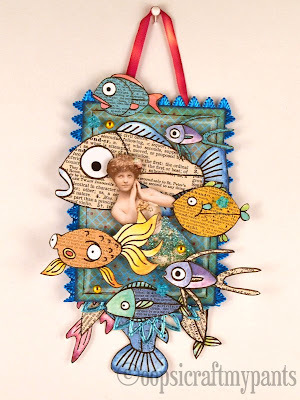 Assemble, glue, and let dry! I hot-glued some round foam to the edges of the ribs to make them smoother...I used the stuff that you use to stuff into cracks and gaps in windows to keep bugs out/good air in. It was in the weather stripping section at Lowe's. Pretty cheap, too. I didn't get a picture of that step, though. Then I sewed some jersey knit material into socks to fit the horns and stretched them over the horn bases. They turned out really light-weight, which is a good thing for such big old horns. The eyeballs are just styrofoam balls cut in half with a bead glued on for pupils. I also had fun making the nose and big teeth out of poly clay! I didn't end up using the little pink nose, but it's still around, waiting to be placed on a bunny mask or something. I google searched on how to make a big mask, and had a hard time finding anything until I started to search in the furries community, LOL. Helpful! My favorite helper was this tutorial, and the plastic mesh worked GREAT. It was only $1.79 for a big sheet of it at Hobby Lobby. It's sturdy, yet flexible, and breathes. Plus, hot glue works amazingly well on it. Once I started gluing on the fur (recycled from a furry kids sweater I got at a Thrift Store Bag Sale) I knew that it was going to turn out so funny and awesome :) I'm pretty proud of the finished product. It's a little heavy, but really not too bad. There's a baseball cap sewn inside to keep it on my head! Can't wait till Halloween! Well, happy Thursday, friends. I hope your week has been fantastic. Good morning! Spring has pretty much come into full swing here... It was about 84 degrees out yesterday and we've had some April showers this past week, too. Bobby and I went to the beach this weekend and it was SO NICE. Nice enough to get roasted, toasted, and burnt to a crisp. That'll teach me to not wear sunblock. But I also heard that a lot of places are getting SNOW! WHAT?! Well, to cheer you snowed-in folks up a bit, here's a cheery yeti in a rosy garden. 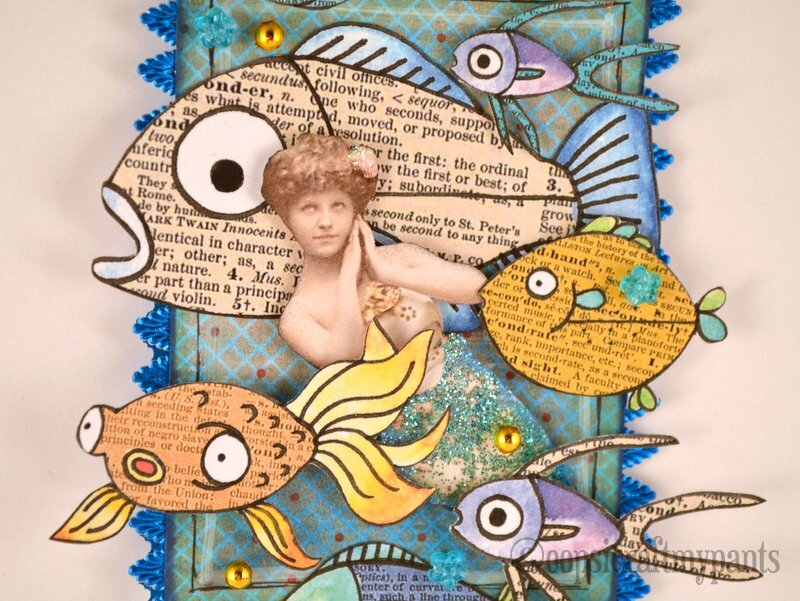 He's from one of my new collage sheets, Little Monsters. Currently hanging on my wall, waving at me and telling me to remember to plant my new tomato plants today. FINE! I'll do it. Happy Tuesday\, friends. Good morning, friends! I am so excited to announce an "Oops, I Craft My Pants" line of collage sheets available exclusively with Alpha Stamps. There are six new collage sheets full of colorful, funny little drawings of some of my favorite things, like monsters and owls, and of course...Toucans!!! 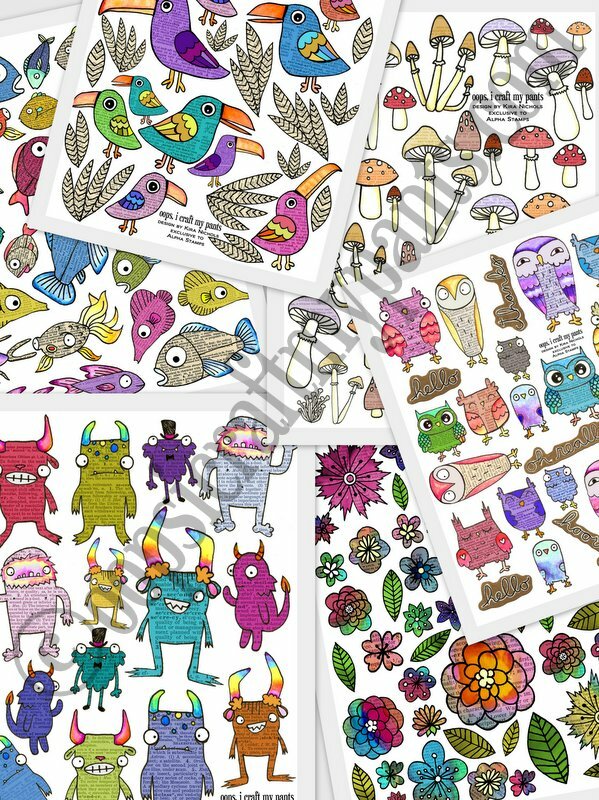 If you haven't had the pleasure of working with collage sheets before, they're available as digital downloads that you can print, or you can order high-quality printed hard copies that are mailed to you. I've got a lot of sample artwork to show you using my new collage sheets, and these two projects are just the first :) I used Kira's Flowers and Toucans for this one. I like to add a little bit of glitter glue for just a little more sparkle. This one is using Kira's Fish. It's April! That means a new lovely kit and swap from Alpha Stamps. 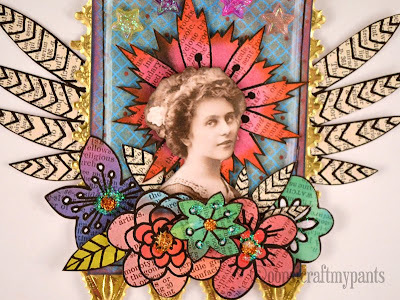 This month's theme is French Couture and there's a 4x6 Postcard Swap afoot. I made two pretty cards. Hehe, that flower lady is pretty cool, huh? If you want to join in the fun, get more info here at the Alpha Stamps Website.